Two dressers are shown below. 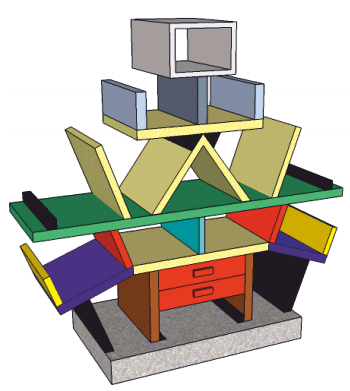 The first dresser is the Carlton dresser, designed by the Memphis movement (1981 Ettore Sottsass). 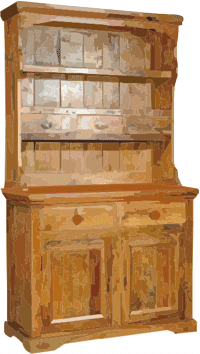 The second dresser is a traditional design, found in almost every furniture catalogue. Its design has a long history, starting in the nineteenth century. This dresser is the type normally purchased by homeowners, to store everyday items. Read the description underneath the traditional dresser. Then add you description of the Memphis version, in the available space. A combination of traditional, rustic and antiqued. Based on a traditional design. Traditional materials (pine) use during manufacture. Has a combination of drawers, cabinet space and shelves. These allow for the storage of a variety of items. Antique looking and designed to fit in with a similar style of furniture, in the home. Which piece of furniture do you prefer? Why?